Lawnmower Blennies are fairly drab looking with a long whitish body and gray to tan colored vertical bars on the sides. A long dorsal fin extends the length of the body. Small light-blue dots adorn the face. Delicate feathery projections called ‘cirri’ around the face lend character. 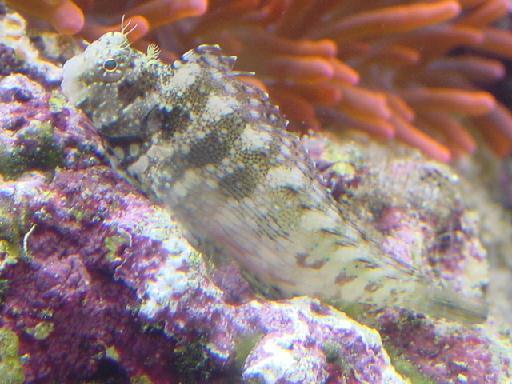 Reef Suitability: Lawnmower Blennies are usually very good reef tank inhabitants in larger tanks. While somewhat plain, they are personable fish. They spend most of their day perched on rocks surveying their surroundings followed by short bursts of algae munching, then back to their perch. There have been some reports of them picking on clam mantles or stony corals, but I have never seen that behavior, so it is probably a minimal risk. Disposition: May chase or bully other fish in close quarters, but usually not an issue in larger tanks. Should be kept as single specimens or as a male/female pair in tanks less than about 55 gallons. Feeding: Lawnmower Blennies are primarily vegetarian. They have teeth that are adapt at scraping algae from the surface of rocks and the walls of the tank. They are frequently introduced to help control hair algae, but they seem to prefer to eat film type algae. They will usually take frozen or dried vegetable foods like Formula 2 and sometimes will take meaty foods like bloodworms. They do best in tanks that have algae on which they can forage throughout the day. Temperature: Does well within normal reef tank temperature ranges of at least 75-84°F. Size: Grows to maximum of about 5″ in length. Intimately, the article is really the sweetest on this worthw hile topic. I agree with your conclusions and will eagerly look forward to your next updates. Just saying thanks will not just be enough, for the great clarity in your writing. I will at once grab your rss feed to stay privy of any updates. Pleasant work and much success in your business efforts!